Percy Heath, Leroy Vinnegar,* bass; Art Blakey, Frank Butler,* drums. Frank Foster's tough, tart, yet full-bodied sound is prominent in both takes of "Crazy." He is heard on each in two helpings, before and after Hope's solo. Elmo Hope's work on the originally-issued take seems more crisply articulated than in the alternate version. Lee, muted, is heard only in the ensemble. Art Blakey's solo on the original take, rumbles along beautifully, hi-hats working feverishly underneath. "Abdullah," (probably a reference to Art's Moslem name, Abdullah Buhaina) is actuated by the drummer with a typical elbow-on-the-drumhead sound. It's a minor-key mover with Hope imparting a Silvery feeling without aping Horace. Chips is a pretty theme which finds Foster Stitt-like with his own, cutting-edge tone. Frank's second chorus is wistful while still burning. 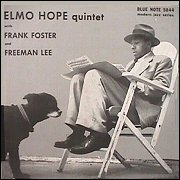 Lee has a half-chorus with a couple of Dorhamisms and, after Elmo's solo rounds that chorus out, Freeman takes a solo bridge in the final melody statement. "Later For You" is a singing, spinning line on "All God's Chillun Got Rhythm" that recalls, in spirit, the Sonny Stitt-Bud Powell collaboration of 1949. Everyone bears down here and Lee, despite a couple of flaws, has his best outing of the set. "Low Tide" [mp3] is a Dameronian theme and, again, Lee leans toward Kenny Dorham. 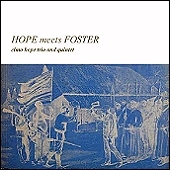 Hope alternates between lyricism and swift double-timing, and Foster again comes through with clarity and hard swing. 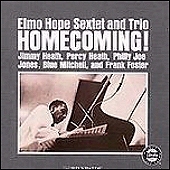 "Maybe So," is another intricate theme with a chord structure that is similar in part to Powell's "Bouncin' With Bud." All the principals solo and Foster has the last bridge as a bonus. Again, all the selections are Hope originals, beginning with the lovely melody and changes of "So Nice." Harold Land's approach has a lighter tonality than Foster but he is always swinging. Williamson exhibits a warm, round sound and relaxed swing. "St. Elmo's Fire," a medium-grooved blues, moves from Elmo's lead-in solo to Land, who really stretches out before giving way to Williamson's muted, sweet-toned blues-saying. Then the horns take it out with a basic blues riff. "Vaun Ex" is a blues with some harmonics akin to Bird's "Confirmation," which was not a blues. Note the section where Butler accents Land's lines right along with him.